I LOVE the SpinTech!! It spins cotton like a hot knife through warm butter. 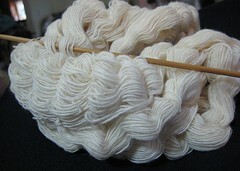 If I want to spin bulky wool, though, I get out the Lendrum. Did I mention the Roketman hooked me up with a battery for the SpinTech so I'm not running off an outlet? I love that man! Oh my gosh, that's gorgeous! 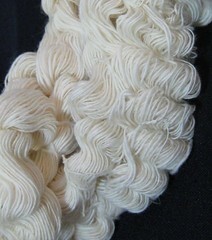 That's the prettiest cotton yarn I have ever seen.